I’m happy to tell you about a great book I was honored to read before it went to publication. It was written by an author friend of mine, Darcy Flynn, and today is release day! This romantic suspense will take you aboard a cargo ship and onto the high seas. Darcy expertly captures the feel of life on the water and takes you on a voyage to discover a mysterious saboteur. Darcy writes sweet romance, and she has the gift of bringing characters to life who are fun, bold, and daring. Her books don’t disappoint. I highly suggest, you give this book a read! Click on the link below, and it will take you to Amazon! Charleston, South Carolina shipping heiress, MIRANDA MERRICK, discovers one of her family’s cargo ships, the Elle Merrick, has suffered multiple attacks by a saboteur. The devious actions have put the company at risk for bankruptcy. Refusing to sit idly, she boards the Elle in hopes of gaining help from her uncle, the ship’s captain, only to find a stranger at the helm. In an effort to discover the culprit and save her family’s company, Miranda stows away on the ship – keeping her identity a secret while conducting her own investigation. Making matters more complicated, she finds herself attracted to the new captain, who could very well be the enemy. Captain NOAH SHEPPARD is hoping to merge his small, cargo shipping line, Clayton Company, with the multinational conglomerate, Merrick Shipping. Upon discovering one of Merrick’s ships has been deliberately and systematically sabotaged by a crew member, he agrees to captain the targeted vessel in hopes of discovering the identity of the saboteur. Two days into the voyage, Noah discovers a stowaway, and assumes she’s either the saboteur or in league with him. But what Noah didn’t bargain for is having to deal with the mysterious, gorgeous, redhead, who wreaks havoc – not only to his patience, but to his heart. This medieval fantasy has been in my heart and mind for thirty years and is finally in print. I grew up loving fairy tales, and I was especially fond of the story of Cinderella. When I saw the musical version starring Leslie Ann Warren as Cinderella, my love grew. It brought the story to life in a way that captured my heart. In my teens, I read the Arthurian Legend books by Mary Stewart. Her writing drew me in and for years I had a crush on Merlin. She captured him in a way I hadn’t envisioned him before. If you have never read her books, I highly recommend them. 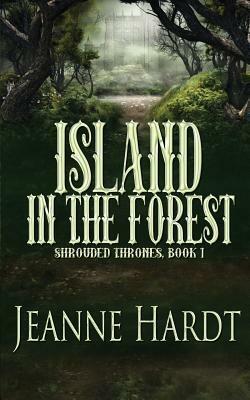 “Island in the Forest” is a love story unlike any you’ve read before. Though it’s set in fantasy realms, I hope when you read it you’ll feel like you’re stepping through the gates of Camelot. However, in my story the gates are locked and no one can leave. Giveaway ends May 20, 2018. Cover Reveal! Island in the Forest! I promised to reveal the cover for my new medieval fantasy, and here it is! It’s going through the final editing stages, and I hope to see it released next month or early in March. Olivia has lived her entire life behind the walls of Padrida, a kingdom unknown to the rest of the world. As the king and queen’s only heir, she’s destined to rule. She’s given everything she needs, but wants only one thing. Boredom plagues Prince Sebastian of Basilia. The realms have been at peace for more than a century, and he has little to occupy his time. He journeys to Black Wood—a dense forest with an evil reputation—seeking adventure. What he finds is something else entirely. For a limited time, Deceptions, Southern Secrets Saga, book 1, is available to download for free! This is your chance to step into the lives of five families who are learning to live and love again after a war that tore apart our nation. I hope they’ll touch your heart. Those of you who are already fans of this series know that it takes you on a roller coaster ride of emotions, with many unexpected twists and turns. True to life, things aren’t always pretty. However, I always strive for happy endings. It’s that time of year, when it’s fun to cozy up with a good book and something hot to drink. So, I decided to recommend a few books that will help warm you up from the inside out. From ‘sweet’ romance writer, Darcy Flynn, Seven Days in December. You can purchase Seven Days in December here: https://amzn.com/B019O2LVIO E-book is just $1.99! Now, if you want to go from sweet to spicy, here are a couple books from author, Cynthia Gail, that will warm you all the way to your toes! First, a romance set in Nashville, Tennessee, Winter’s Magic. Perhaps you’d rather escape to another country for a bit of Christmas-time romance. How about Paris? Cynthia Gail’s, A Paris Christmas, will take you there. As for my own books, both of my series have Christmas chapters, so if you want some lengthy reads, start with book one of my Southern Secrets Saga, Deceptions, or perhaps book one of the River Romance Series, Marked. Buy links for all my books are found by clicking the books tab above and scrolling down to the book you’re interested in. For this special blog, I’m featuring my slightly unusual, yet magical tale, A Golden Life. Not only does it take place over Thanksgiving and Christmas, it, too, is a bit on the spicy side, and will take you on emotional roller coaster. You’re sure to laugh, and likely cry. But like all my books, it has a happy ending. Traci Oliver may be a best-selling romance author, but for the first time in her writing career, she can’t type a word on the blank page. Book number fifty is supposed to be her best ever—her golden book—but inspiration joined her husband in the grave. How can she write about love with a shattered heart? At the precise moment of the anniversary of his death, a knock on her door changes everything. Characters from her books take on human form and tell her they’ve come to help her. Of course, she doubts her sanity. Are they real, or has she lost her mind? When she lands smack dab in the middle of one of her own love scenes, she assumes the latter. Her doctor says grieving is a process, but she never dreamed that part of the process would bring her heroes to life. She wonders if all people experience this kind of thing, or is it a weird phenomenon reserved solely for romance writers? Truthfully, the only hero she wants is her husband, and she can never be with him again. I wish you all happy holidays, and very soon, a more-than-merry Christmas! I’m so excited to welcome Darcy Flynn to my blog! Darcy writes sweet romance, and I can honestly say, she’s a very sweet and kind person. Her stories reflect her genuine personality. I had the privilege to read her newest release, Double Trouble, and I absolutely loved it! I was honored to have a sneak peek before the actual release date. Darcy writes with a warm unique voice and pulls you right into her characters. She makes them real. I hope you all will give her books a read! I could go on and on, but I want to share the information about her book, then I have some questions for her! Darcy, what inspired you to start writing novels? I’d been writing non-fiction for the Christian and Home School market for years and after my son went to college, I found a box of 70’s Harlequin Romances in my attic. It was like Christmas. I’d forgotten I’d kept them and since I was officially an ‘empty-nester’, I decided to re-read some of them. As I did, I’d think…I could write one of these. So I did and wrote Keeper of My Heart. What makes your work different from other books in your genre? My novels are so much fun! Romps for the most part. They’re similar to the vintage 70 stories, like the clean, Hollywood romantic comedies from years ago or the sweet Harlequin Romances, without the omniscient POV of course! Some of my readers have even told me my novels should be Hallmark Channel Movies! Yeah! I so agree with that! What are the most interesting character traits of your hero and heroine? Well…all of my heroines seem to be rule breakers. As much as I try to make them otherwise. I’m not a rule breaker – much to my own loss I might add. So, I love it when my heroine throws caution to the wind and does something she’d never do under normal circumstances. I really like that about my heroines! And if it happens to drive my heroes just a little bit crazy, then so be it. As for my heroes, well, they don’t take a lot from these feisty gals. They’re no-nonsense kind of men and always up for any challenge my heroines toss their way. They’re quite dreamy and delicious. Okay, I know that’s not a character trait, but I couldn’t resist sharing that with you. Oh, yes. The sequel is Wes’s story. It’s called, Double Take. More to come about that one later. In business, Clare had one hard and fast rule—never get involved with a client. As tempting as he was, she made a half-hearted attempt to pull away. “No. Wait. Don’t think.” He gently tapped her chin. Her eyes locked with his mesmerizing ones. Blue, like the ocean. Dancing with the light of the late afternoon sun. For a brief moment they roamed over her face, hungry, desiring, then he lowered his head. A Golden Life .99 cent Promo! Starting today thru midnight on December 26th, you can purchase the e-book version on Amazon for this low price. I hope you’ll give it a read! The story is set in the beautiful mountains of Gatlinburg, TN, but nothing about the plot is typical. It will take you on an unusual journey to say the least. Traci Oliver may be a best-selling romance author, but for the first time in her writing career she can’t type a word on the blank page. Book number fifty is supposed to be her best ever—her golden book—but inspiration joined her husband in the grave. How can she write about love with a shattered heart? When characters from her books take on human form and tell her that they’ve come to help her, she doubts her sanity. Are they real, or has she lost her mind? Her doctor says grieving is a process, but she never dreamed that part of the process would bring her heroes to life. She wonders if all people experience this kind of thing, or is it a weird phenomenon reserved solely for romance writers? Truthfully, the only hero she wants in her life is her husband, and she can never be with him again.